Sing & See is designed to meet the needs of singers and teachers working in all vocal styles and genres. It gives an almost instant visual representation of the singing voice, allowing singers to see the acoustic characteristics of their voice while they sing, and then to listen to it being replayed - again seeing it directly on the screen. 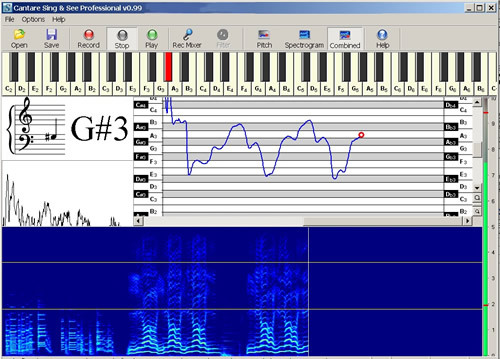 The software can be used to illustrate aspects of your students' vocal production, as part of your normal lesson. It can also be used as a practice aid, to allow students to spend time on their own practising a particular exercise that you set. We have developed a Student Version with a simplified display, specially for this purpose. Some teachers are also using Sing & See as a way to help focus attention during warmup exercises. Indeed, there are probably as many different ways of using Sing & See as there are individual approaches to teaching singing. A few pointers to getting started are given here. The visual display can be used to illuminate vocal characteristics that may not be clearly perceived by the student. For instance, if your student is having difficulty in matching pitch, then you can use Sing & See to show the student the target pitch and the pitch they are singing. As the student slowly slides the tone up and down, the display mirrors the changes in pitch, giving the student visual reinforcement of what you are explaining in words. The student can then use this information to begin associating the sensation and the auditory perception of the correct pitch. This reinforcement of correct pitch is also important when the student goes away to practise - they can use the visual mirror of the voice to check that they are still "in tune". Pitch display - the note is shown clearly by the change of colour on the piano keyboard, and also by the stave-note display. The history of the sung note is shown by the blue line trailing the red dot. Visual feedback can be used directly to help guide the student towards reaching a specified target. For instance, you can set a visual goal such as performing an arpeggio, and the student can spend time practising to try and better achieve that target. Of course, if the student is to progress towards reaching the desired target - what they can see - they need to know what they should be working on to improve their performance. So you might tell them to focus on their posture, or whatever it is that you see they are lacking. The visual display however gives the student some positive reinforcement that they are getting closer to the target. What is this student doing? Listen. Acoustic analysis and display of the voice is a rich source of information that can help the student to gain a deeper understanding of the voice and how it works. For instance, the spectrographic display allows you and your students to explore the harmonic structure of their voices and how it changes across different vowels and through their vocal range. The combined display in Sing & See shows both pitch and spectrographic information, giving a wealth of detail about a student's voice. In this view, you can see clearly the increased higher harmonics that appear when the voice is properly supported. "This is a very useful product. My son has been using it to help with pitching when playing his trombone. Like a voice, it is very easy to wander around off pitch"